It’s one of the hard truths of our society today, and it’s so ingrained that there have been song lyrics written about it: it’s all about the money. No matter how enthusiastically you chant that tune, you may stop short when you think about its harsh reality. And the fact is teaching kids about money is essential. Teaching kids about money is not about making them afraid to spend it, nor about making them paranoid that if they buy themselves some candy, you won’t be able to pay the bills. But it is about teaching them not to steal your credit card and go buy an iPhone. Yes, shocking as that may sound, I’m sure there have been cases. Despite truth being a relative notion, money, your kids must learn, is in the hands of the parents. No matter how much allowance you give your kids, they need to know that it is still not their money, and that the way they choose to spend depends on your approval. Imagine yourself, not as an evil banker, but as an accounting advisor for mini humans. Boy saving money in the piggy bank. 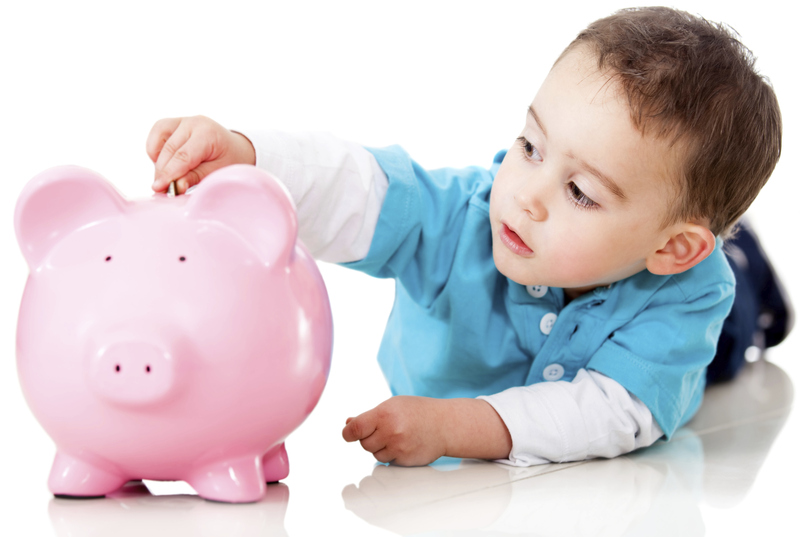 The first and most important thing your kids must understand is that the more time passes, the more money accumulates. This is not necessarily as complicated as your banker makes it. It could be as simple as explaining to the kid that if he puts aside the money he spends daily on junk food, he could in time buy something awesome. Like that cool video game, or maybe something grander, depending on how much he can save. This could also be a suitable means for you to understand his spending habits. The single most important thing, and something that many parents avoid, is teaching the kids that even mommy and daddy need to figure out how to spend their money. Behave financially, don’t overindulge, and the kid will learn to imitate your behavior. Also, when in the supermarket with the kids, make decisions about what to buy based on price vs quality out loud. This way, kids will understand that money is finite, even for you. Furthermore, don’t use credit cards around your kids, these confuse them. As much as possible, use cash when around the little ones. If your kid wants to buy something, don’t stress too much when you can’t afford it. It may be that he will begin to worry about his family’s financial safety. However, in some cases, it may be the only solution to make the kids understand why you can’t buy the desired object. Adversely, don’t say that anything is very cheap — since the kid will begin trying to reason with you by saying that what he wants is only a bit pricier. Money runs everything today, but don’t let it run your kid’s life. Give your kid $5 to buy specific items. We suggest you go for fruit or vegetables, and subsequently tell the kid to choose some that look good, but also aren’t too expensive. This way, he will be forced to make money decisions for himself. Sure, he may bring you a few rotten bananas, or a few green oranges, but at least next time he will know exactly what he did wrong and correct himself. As he grows, he may turn out to be able to go to the supermarket by himself, and not spend all the money on sweets and junk food. There is a division in public opinion with this one, but it’s generally believed that giving a weekly allowance to your kids is a good thing. Financial researchers suggest that if you begin at the age of 6 by giving the kid a weekly allowance, he or she will better understand the meaning of money. In time, as trust grows, the parents can give their kids greater amounts of money over greater periods of time. We told you that you were an evil banker, didn’t we? However, this behavior has a catch. Never give your kids loans. If they spend up to their allowance, then, as some may say, “bummer.” That’s too bad. He’ll just have to wait. Once they reach the age of 14, kids are old enough to understand college loans. Talk openly to them about the possibilities that you have to pay off the college tuition and expenses before and not after they finish their education. Explain to them that if you make these sacrifices now, the kid won’t be left paying off his college debts after his studies end. Making him ready to spend his newly earned money exactly as he wishes. Through these type of talks, kids will understand for themselves what long-term financial decisions actually mean. Going to college is expensive. Be sure you have enough money.